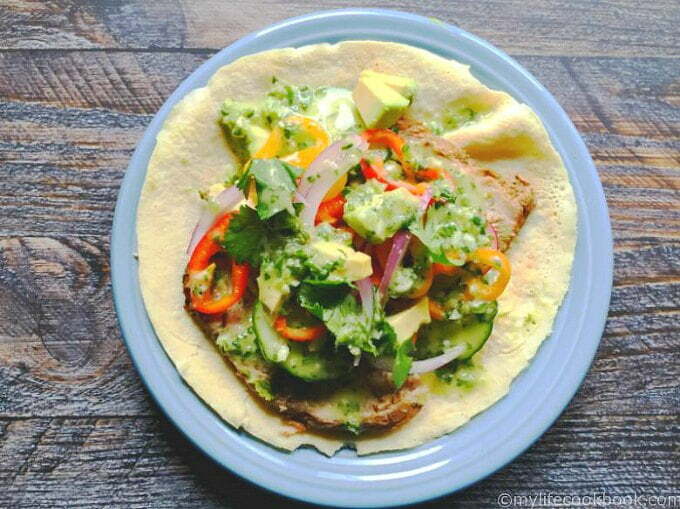 Try these delicious citrus pork tacos with coconut tortillas and cilantro dressing. Gluten free, Paleo and low carb as well. Perfect weeknight dinner. My husband and I watched the movie Chef the other night and we were drooling over the Cuban sandwiches. At one point they had a big pitcher of what looked like a margherita mix and poured it over their pork to marinade and I thought to myself, I gotta try that. I’ve been playing around with coconut tortilla for the last month and thought the pork would be great with the tortillas. 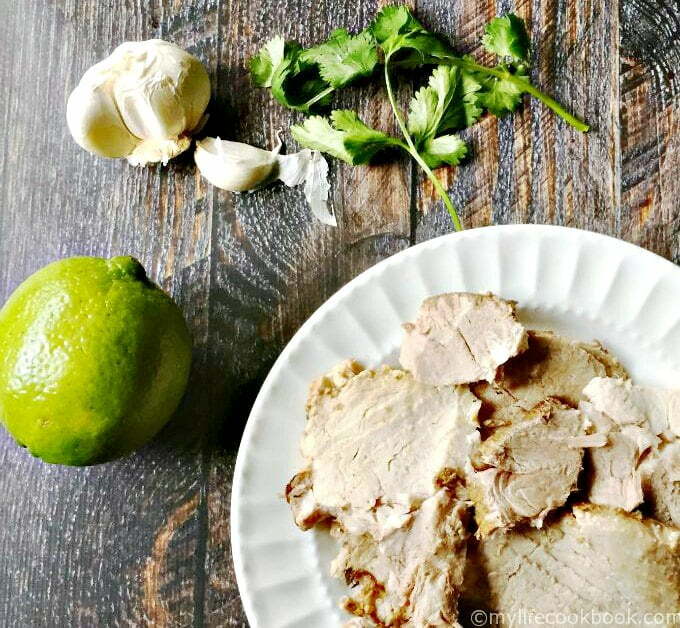 There are 3 recipes in this post: coconut tortillas, cilantro dressing and marinated pork. All of these recipes can be used separately for other meals so this is a real deal kinda post. Below you can see the coconut tortillas. 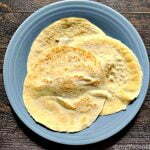 They were very easy to make and while they were not as chewy as a flour tortilla I thought they were a great gluten free substitute. I will be making a lot of these for myself. I think they will freeze well but I have not tried it yet. They are perfect for a taco or a sandwich wrap! The ingredients are simple: coconut flour, baking powder and egg whites. Mix in a blender and make them in a skillet like you would a crepe. Easy peasy and great nutrition. One tortilla has 54 calories / 0.7g fat / 1.5g net carbs / 8.6g protein. Now we come to the pork. I’m excited about the pork because I bought a huge pork loin for this meal and it ended up being enough for 3 meals. I’ve been playing around with the idea of making my own lunchmeat and I found that this pork dish would make delicious sandwiches because it is very tasty and you can slice it pretty thin. Essentially you are marinating the pork in a citrus juices, oregano, cumin, garlic and cilantro for about 4-6 hours and then cooking it in a dutch oven. It came out moist and tender and delicious! I’m sure you could make it in a crockpot too. We ate it the first night as a roast, with potatoes and my new go to broccoli dish . My hubby took leftovers for lunch the next day and then we had tacos the 3rd night. Those are my kind of meals. Cook it and then eat it for 2 more days. The third recipe is for a cilantro dressing. This is very garlicky and I just love it. It makes the tacos in my opinion. We use this dressing all the time when I make a tacos or rice bowls and use this Cuban Pot Roast for the meat. It’s just fresh, green and tangy and adds an extra something something. It’s very similar to the marinade but it also had some jalepenos in it. I took out the seeds and veins so it wouldn’t be too hot. The ingredients are oranges, limes, garlic, cilantro, jalapeños and olive oil. I didn’t add the avocado because I wanted to put that on my taco but you could add it to the dressing and it would make it creamier. Now that you have all your components, you can put together your taco by using a coconut tortilla, slices of the pork, toppings of your choice and finish with the cilantro dressing. You could also make a rice bowl and substitute the tortilla for a bowl of rice or make a burrito with rice and beans and the pork and cilantro sauce. Or lastly you could make a big southwest salad and omit the tortilla. So many options! For my tacos, I love having colorful vegetables; I used radishes, peppers, red onions, cucumbers and avocados. You could use tomatoes. lettuce and cheese if you like a more traditional taco or as I have mentioned rice and beans to make a small burrito. So my friends these are my recipes for a south western Citrus Pork Tacos with Coconut Tortillas and Cilantro Dressing. 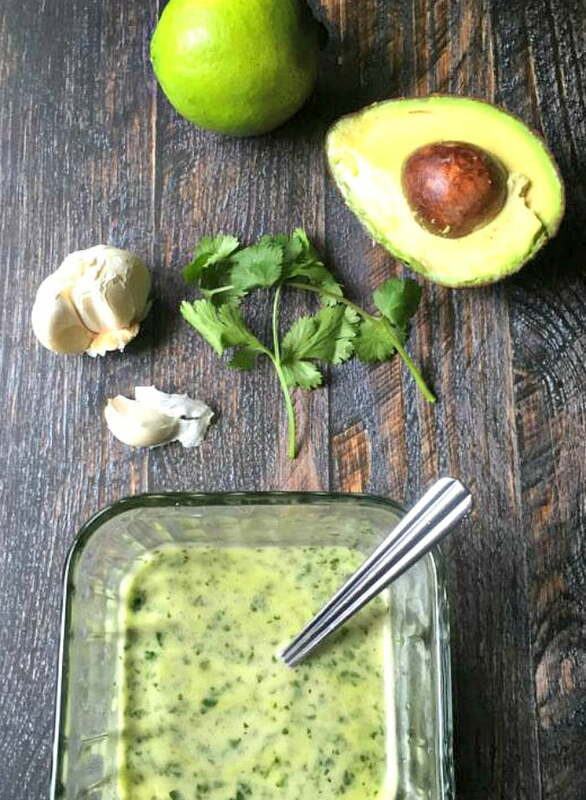 Another dressing that would go fantastic with this is my creamy avocado lime dressing, check it out. I hope you liked it as much as we did. This will definitely be in our regular meal rotation! These are quick and easy to make and versatile too. You can make the sweet or savory with the addition of herbs, spices and sweetener. Add all ingredients to a blender and blend on high until everything is well mixed and there are no lumps. Let sit for 5 minutes so the coconut can hydrate. Heat two small frying pans on medium heat. Spray with cooking spray or use coconut oil or butter to grease pan. Add 1/4 cup of mixture and quickly swirl so that the whole pan is covered. Once the edges get brown and the top is no longer shiny, flip pan into second (empty pan) to cook the other side. Note you can just flip them with a spatula if you like but these are a bit fragile and I find it's much quicker and easier to do it with two pans. Cook on second side for a just a few minutes and then transfer to a plate. Pour everything (except pork) into a blender or food processor and blend. Put pork into a large ziplock bag and add the marinade. You may have to cut the pork in half if it is too big. Set in the refrigerator for 4- 6 hours. When ready to cook, heat your dutch oven on high and a tablespoon or two of olive oil. Sear your pork loin on both sides for about 4 minutes each or until you get it browned a bit. Add back the marinade and turn the heat down to medium. Cover and cook until the internal temperature is about 170 on a meat thermometer. This took me about an hour. Let rest for 15 minutes and then slice. Blend everything in a food processor or blender. Use as a salad dressing or on top of chicken, fish, or pork. I love the mojo marinated pork! Your recipe sounds great! I love it too. I have a frozen marinated piece in my freezer that we are going to eat this weekend. These look great! Do the shells have a coconut flavor from the flour? My husband makes grilled fish tacos and these would work great with some grilled mahi and mango salsa. Thanks! They have a slightly sweet coconut flavor yes. The only thing I miss from they is the chewiness of a traditional tortilla, otherwise they work great for me. The fish tacos sound awesome! What delicious looking tacos! And that dressing! Wow – what an amazing taco! I must try it! I found your lovely blog on the SITS Sharefest. This looks so tasty! 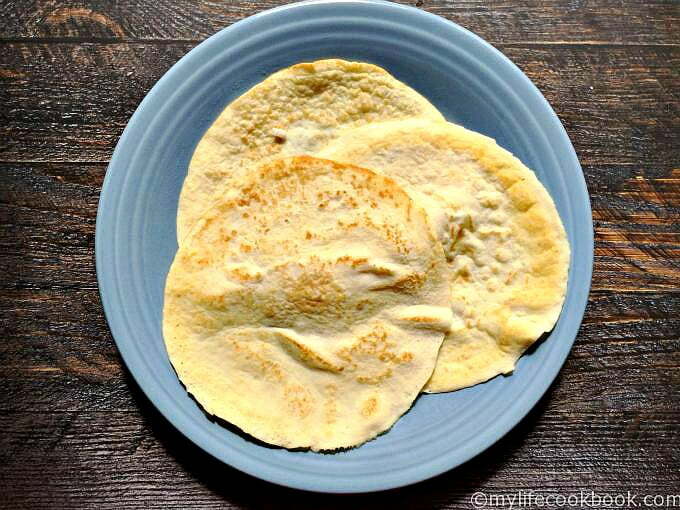 I can not wait to try the coconut tortillas–so intrigued! 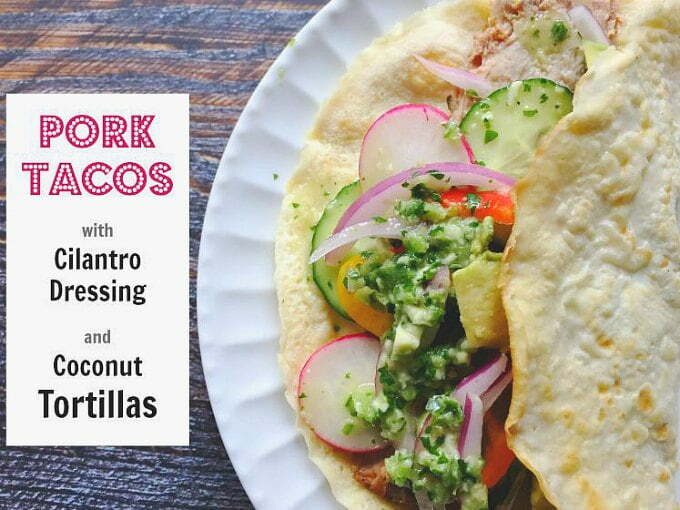 I’m not a fan of pork so I would substitute chicken but the coconut tortillas sound delicious! Have a terrific week! I think that would work splendidly!